Consequential applications #2, where is sea ice melting today? 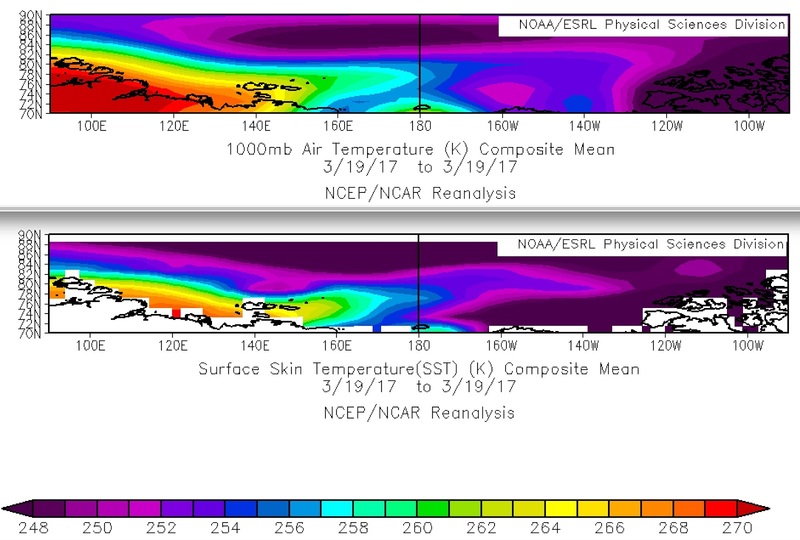 NOAA daily composites March 23 2017. 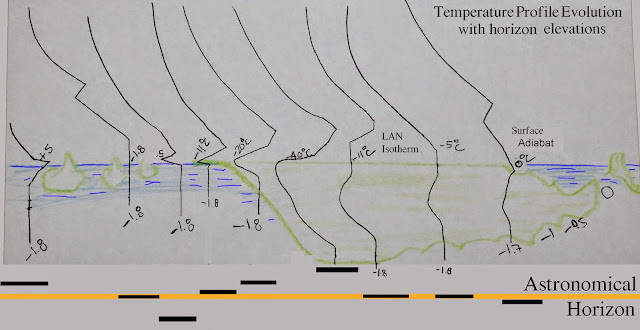 Skin temperature (left) surface air temperature (right). Barents sea area, vicinity Franz Josef lands Russia, there is a band where Ts=Ttsi , or Ttsi is a bit warmer than surface temperature, I usually would consider this as within margin of error from Satellite acquisition, I consider the mean Ttsi= Ts there. Skin temperature areas marked in black where the likely melting is occurring. ~Far from exotic "interesting mirages" , the first rule of sea ice refraction theorized from multiple horizon observations gives many key climate applications. implies a warming sea ice surface automatically gives warmer surface air. sun rays become vertical enough to cancel them at the source, the "skin" surface. 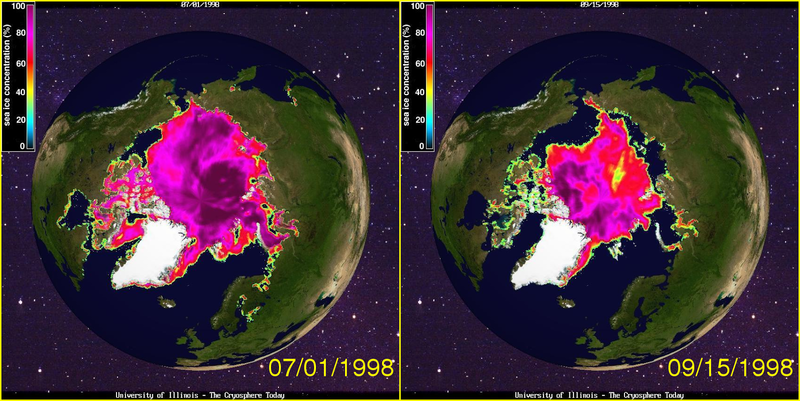 1987's spring was very cold, it was well pre 1998 onwards steeper summer demise of Arctic sea ice volume and extent. We notice NOAA ESRL "surface skin" temperatures with same color scales Mean Composite March 1 to 15 1987 followed by 2017. The first deep signal gathered here is how massively colder Arctic Ocean ice pack was in 1987, nearly all of the Arctic Ocean in deep purple, with 238 Kelvin at the Pole, 246 degrees Kelvin at its periphery. Note the red zone North of Atlantic ocean, warmer than 264 kelvin, this is the only common mean temperature with these 2 periods 30 years apart. 2017 has geographically much warmer skin temperatures, reflecting the thinner sea ice locations. Since the prime refraction rule posits surface air temperature always warmer than "skin temperature"
the surface air from 1987 to 2017 warmed proportionally while always warmer than sea ice , again only the extreme North Atlantic has had similar temperatures between 1987 and 2017. Since 1987 same period interval, the North Pole area warmed 14 to 20 C exactly where the thinner ice is today. The key source of this rule is at top of ice or snow skin, its temperature follows the surface air temperature trends. Top of thinner sea ice is much warmer than thick sea ice. Therefore the air has warmed along with the advent of thinner sea ice by substantial average margins. 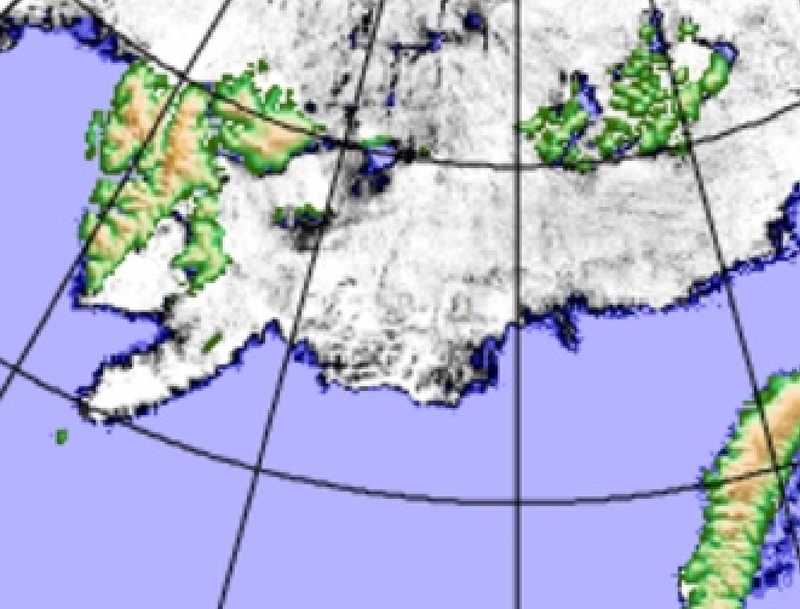 This absolutely implies a current much thinner near North Pole sea ice pack, while very thick multiyear ice North of Ellesmere and adjoining Islands are now the last remnants of a once much thicker Polar ocean pack spread out all the way to Russia. 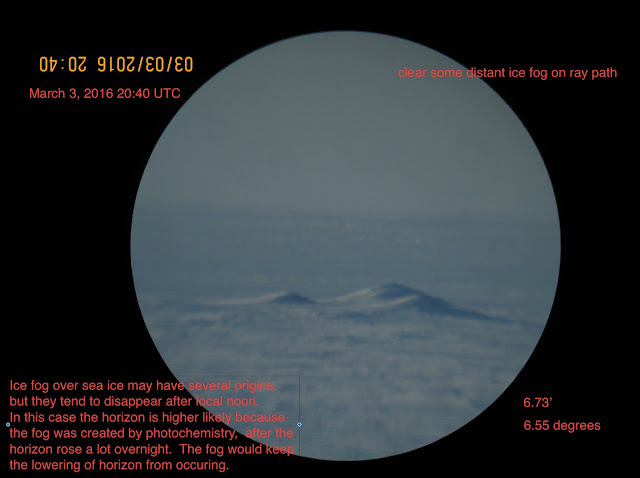 First rule of sea ice horizon refraction proven. Horizon (in orange) coinciding with the horizon (in black horizontal line associated with the temperature profile). Prior to that, another very important feature dominates: top of sea ice is always colder than surface air. 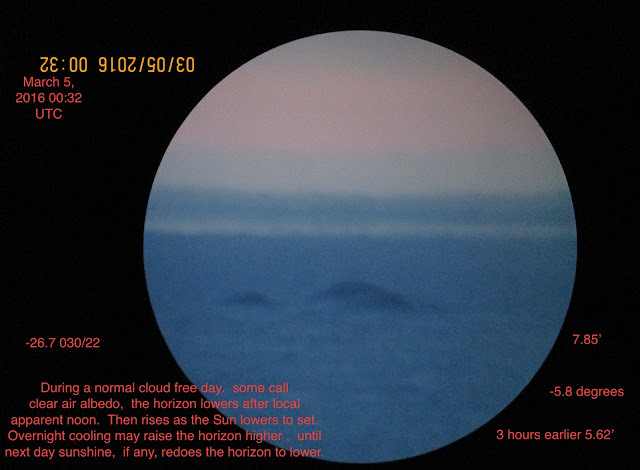 This gives a near permanent high horizon height, till the sun warms top of ice and in turn warms the air immediately above, then as the sun gradually rises higher day by day the horizon finally drops to A.H. But this higher than A.H. period needed data. During the dark season, top of buoy thermistors were always colder than surface air. Nice sunny High Arctic day, in the snow drift shade atop a 1 meter high snow column density .36, the temperature of the top of snow was -32.3.
measured with a high precision Omega monitor attached to very sensitive Thermistor rated +-0.1 C.
A few meters away , the ventilated 2 meter surface temperature was -30.2 . In the sun above or below snow , the thermistor warms rapidly to -29.3 in a few seconds. Still outside , 1 minute later the thermistor keeps on warming to well above -27 C. The sun affects the thermistor greatly. Just like sea ice buoy thermistors embedded in snow. Top of snow column being about 1 meter above ground, mid way down sideways, a shade reading is stable at -26.7 C. Like sea ice, the ground was warmer. 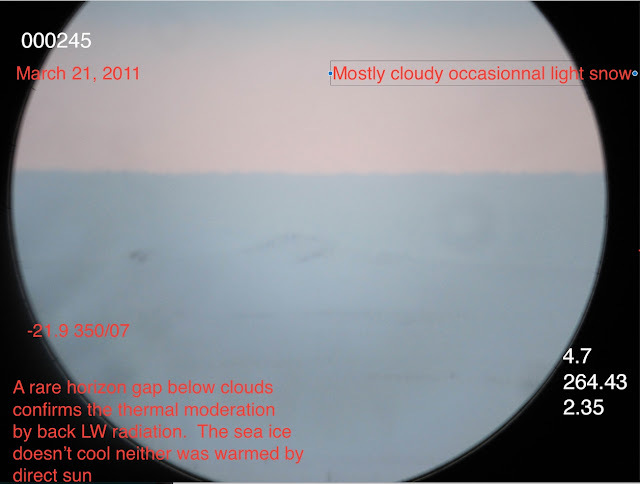 After several days of data, it doesn't matter whether it is sunny or cloudy, day or night or whether the temperature trends warmer or colder, the temperature of top of snow column in the shade (or during evening) was always colder than the surface air. Thus proving the first rule of sea ice horizon refraction. I await warmer days. 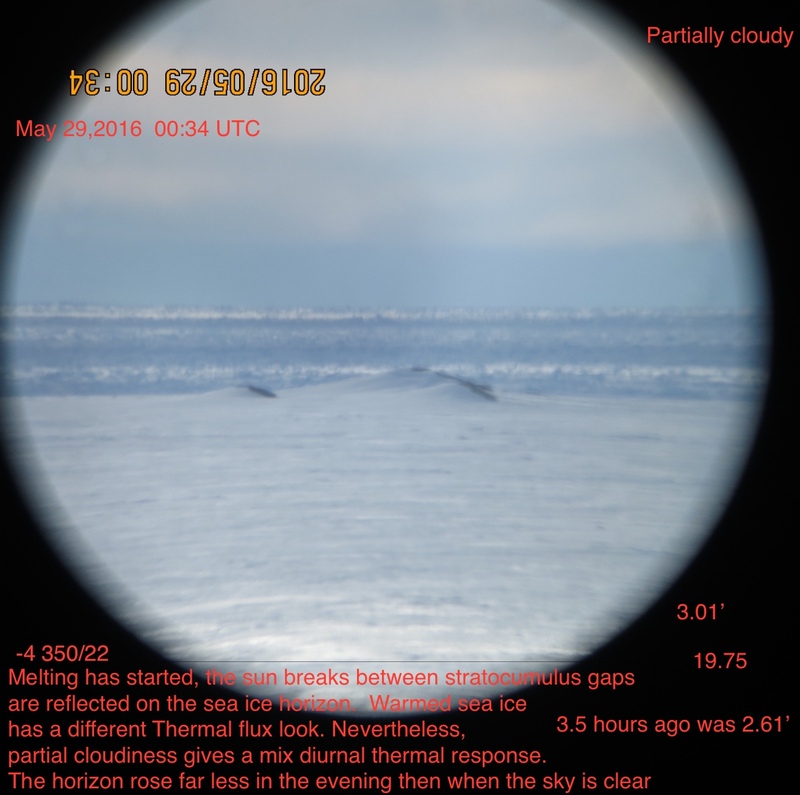 Day after, March 21 2017, outside temperature was -28 to -29 C above sea ice with no 2 meter high ventilated surface reading, the picture above is snow over sea ice temperature measured within a snow drift shade, -30.2 C. By the ventilated screen, 3 kilometers away 46 meters ASL, outside temperature was -30 C with top of snow -34 C (in the shade). Sea ice surface here was about 40 cm below. Top of sea ice snow was 4 degrees warmer than top of land snow. This helps explain why the coldest Arctic air formations usually occur over land and or in the not so distant past, over very thick sea ice. Right by thermistor in the sun. As warm as -26.8 C.
Direct vertical probing, -25.3 C in the shade, a few centimeters below the surface layer, sea ice snow was warmer than land snow. 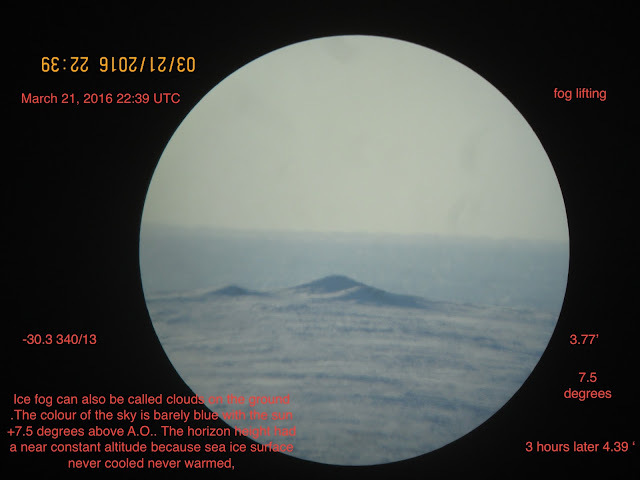 Right by vertical probe hole, snow skin subdermal was -30.4 C, colder than surface air and the snow column just below it, there may be lateral light scattering affecting the deeper reading. A small tide crack, 2 meters deep, sensor is about 30 cm from surface in open air, the temperature was -20.8 C. These openings are very common over the Arctic Ocean, the heat injection they give should be quite huge since there are hundreds of thousands such openings. ~NWWO strikes again, leaves a last taste of wild temperature variations. Varying thermal fluxes as portrayed by sea ice horizons. ~Clouds help discern 2 distinct albedo reactions. blue lines. Knowing Tamino's thorough laser dedication to exactitude, this graph likely represents the standard widely used Albedo reference numbers. 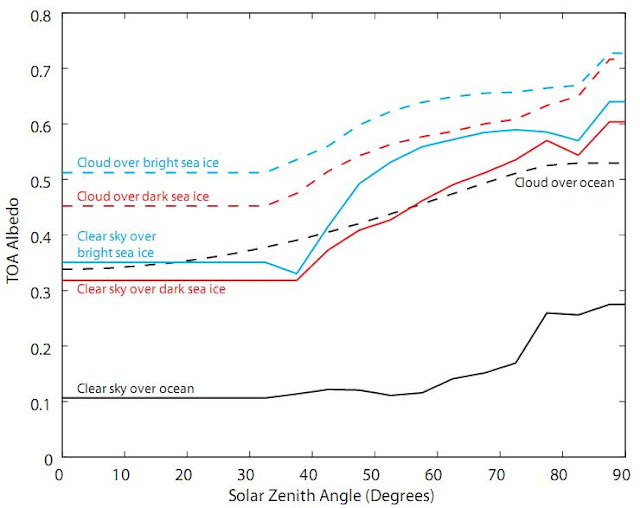 Note the "clear sky over bright sea ice" vs "cloud over bright sea ice" small 10% difference. We deal here with these 2 features. Keep in mind the actual horizontal view largely contradicts this. If there is albedo reflecting clouds at Local Apparent Noon, the horizon view is dramatically different than with "clear sky albedo" consistently and repeatedly, incoming sun rays become very deflected, leaving a dramatic difference in horizon heights, either at Local Apparent Noon or especially seen easier later as the sun lowers to the horizon. 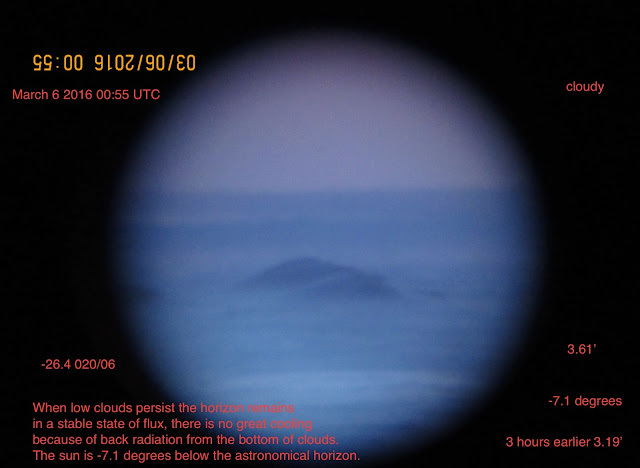 A complete cloud cover leaves the horizon altitude in a steady state of flux, as opposed to "clear sky albedo" which enables the observer to witness various thermal effects un-impeded. This implies that back radiation from bottom of clouds leave sea ice in neither extremes of cooling or warming. Therefore heat which could be gained from direct sunshine is lost. During the dark Arctic long night, clouds do just the opposite, a lot of heat is not lost to space, while during the long Arctic midnight sun days, persistent strong albedo clouds prevent a great deal of melting. The integrated albedos (graph above) perspective may be an erroneous concept. Albedo layers should be calculated individually layer by layer following the sun ray path. The idea of merging albedo layers is good, but 50% seems too low given the greater cloud cover when sea ice cools the warming summer surface. "Cloud albedo varies from less than 10% to more than 90% and depends on drop sizes, liquid water or ice content, thickness of the cloud, and the sun's zenith angle. The smaller the drops and the greater the liquid water content, the greater the cloud albedo, if all other factors are the same. The presence of extensive multi layered cloud spreads, often covering the entire Arctic Ocean for weeks, certainly brings up the cloud albedo value well above the 50% mark. On occasions, such as during summer 2007, with persistent anticyclones, next to land and moving northwards, shatter clouds important ice protective vail, plummeting the ice pack to melt rapidly. One primary reference for 50% integrated albedo was the Sheba project, although the vanishing albedo is correct interpretation of latest melt trends, the nature of sea ice albedo is less variable than cloud cover. The open water footprint amongst sea ice at minima in 1998 suggests there was a great deal of insolation leaving mostly atmospheric absorption and sea ice albedo to reduce the melt otherwise with the full force of nearly direct sunlight and of course lesser total albedo. ASIMP = Area of entire Arctic Ocean X TOA TSI for Arctic Ocean 6 months from spring equinox to fall equinox X average summer sea ice albedo X Atmospheric Absorption factor X Average cloud albedo / sea ice latent heat of fusion. Gives ASIMP = 15,081 km3 (calculated mar 7, 2017) close to the actual POMAS latest summer melt 17,500 km3. 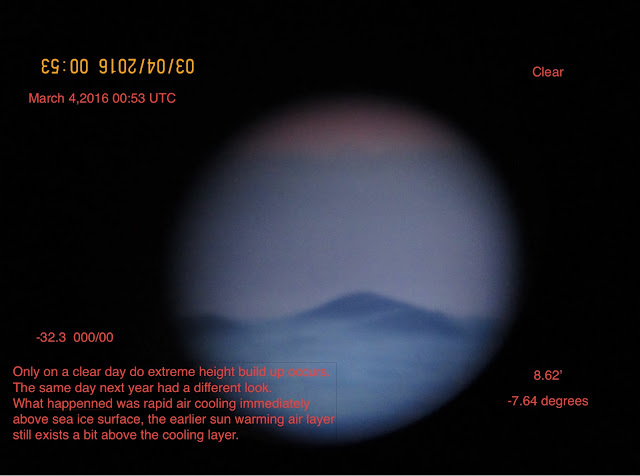 (77% cloud albedo is needed to make ASIMP equal to 2016 summer melt). These variables were at first taken from different sources, I did not try to fit with known melts, and they need be perfected, leaving the greatest yearly variation to cloud albedo. This reformulation calculation gives a fairly interesting estimate. 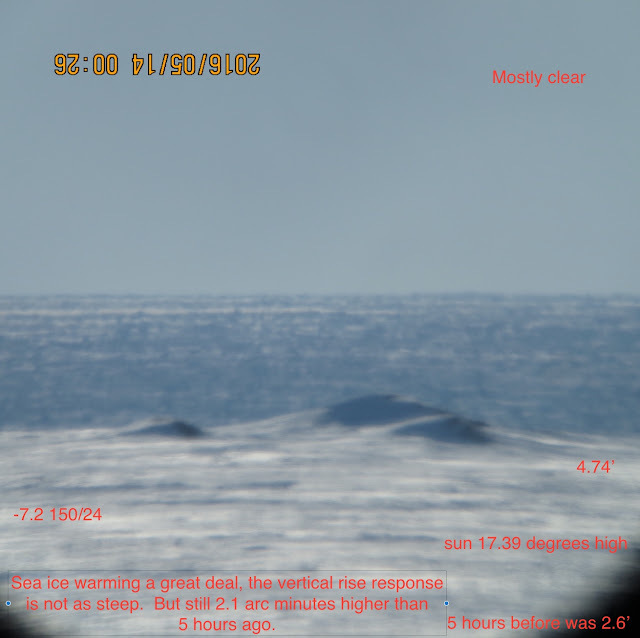 Series pictures displaying different sky conditions and resulting thermal flux action at the sea ice horizon. If horizon outgoing thermal heat is equal to incoming Astronomical Horizon is achieved. 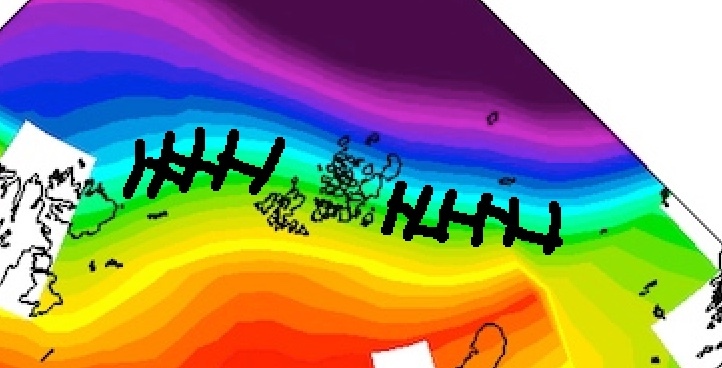 All pictures mostly above A.H. indicating net thermal loss from the sea, those at A.H. will be indicated. None can be below A.H,. 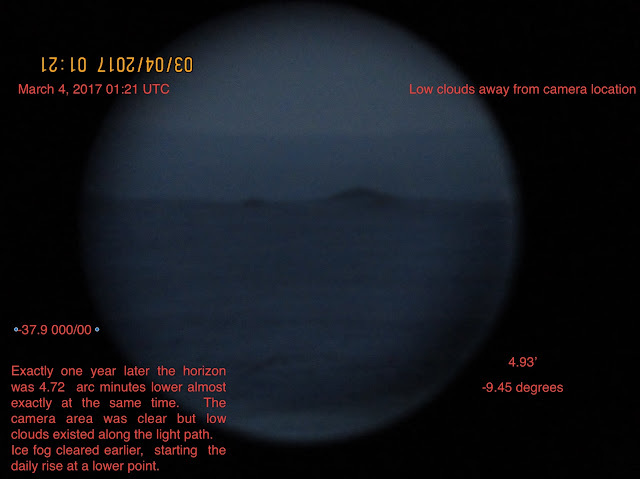 On all pictures, top left: date time, top right: general sky condition, lower left: temperature wind speed with narration, lower right: sea ice horizon elevation (2.6' is astronomical horizon) below is sun elevation in degrees. 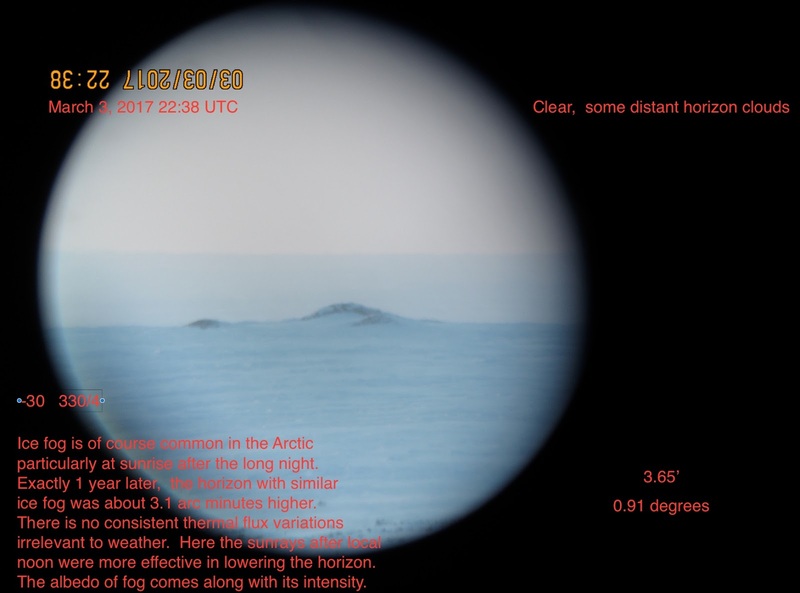 Clear sky albedo, all sea ice albedo.